The Clauses are specific prerequisites and conditions, your company refers to and demands present or absent when committing to the delivery of a particular service. These could be safety precautions, resources availability, arrangements regarding variations of the job description, the availability of special amenities or accessibility equipment and machinery etc. For ultimate convenience JGID allows the user to create default linking between an item in the inventory – Service, Material, Instrument, Consumable or PPE – and a Clause entry into JGID, thus allowing the automatic preloading of a set of specific texts into your Quote. You simply need to add an item into your Quote list and JGID will add the rest of the relevant information, previously associated with this item. This will enhance your time efficiency management and productivity when quoting plus it will further secure your offers form lacking crucial conditional provisions helping you better protect your business assets. 1. 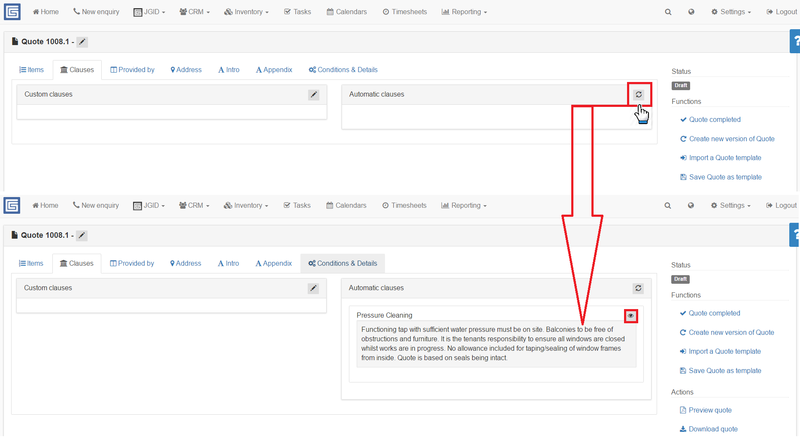 To toggle the actual visible appearance of all the Clauses associated with a certain Item, click on the Clauses tab onto your Quote dashboard. Option 1: Type in your custom made Clause by clicking on the Edit pen icon and entering the relevant text. 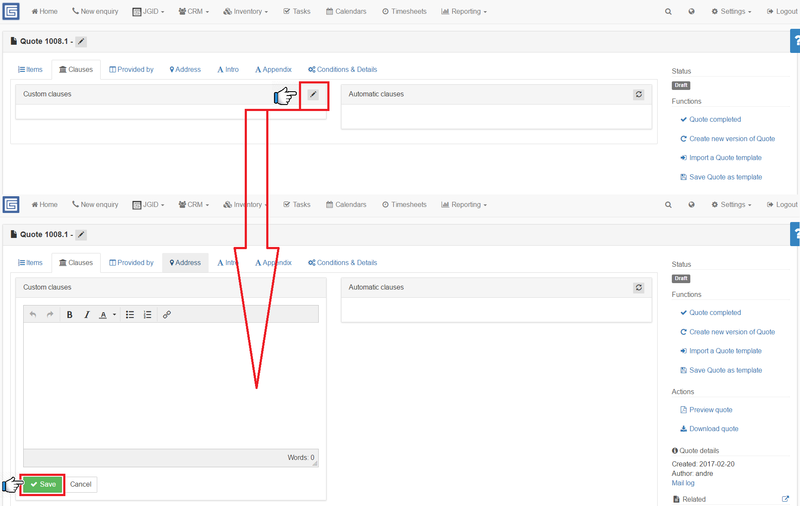 Once you are satisfied with the custom clause content, click on the Save button to keep the changes. Option 2: To load the already associated with the particular Item defult Clause texts, click on the “Generate” button This makes any text associated with the Item visible into the quote. To prevent a particular Clause entry from displaying into the Quote, click on the Eye icon next to it. The icon then changes into a Cross Eye icon , indicating the entry is no longer visible into the document. 4. To ensure the Quote reflects your intended features and contents, click on the Quote preview icon on the right side of the screen under the Actions tag, to have a preview of the current pdf document.